Today we had a chance to play tourist in our own town. At 3:30 this afternoon Linda, our granddaughter Madison and I boarded the Ocean Magic II, one of the many boats operated by long time Victoria Whale Watch operator, The Prince of Whales. Our guide Claire Butterfield was there to greet us, along with 50+ other folks looking for a good time. And a good time we had! We cruised through the Inner and Outer Harbours enjoying the sights, and then captain Jeff kicked Ocean Magic into action. At 31 knots, we rocketed across the waves toward Race Rocks in Juan de Fuca Strait. This incredible ecological reserve is Canada’s first protected marine area. These tiny islands are home to a large number of harbour seals as well as California and Stellar Sea Lions, sea otters and marine birds. The underwater marine environment is just as colourful as Butchart Gardens. A collage of a small representation of the underwater life is included in our pictorial. Sea life is abundant because the rapid currents that pass the islands provide an abundance of food. 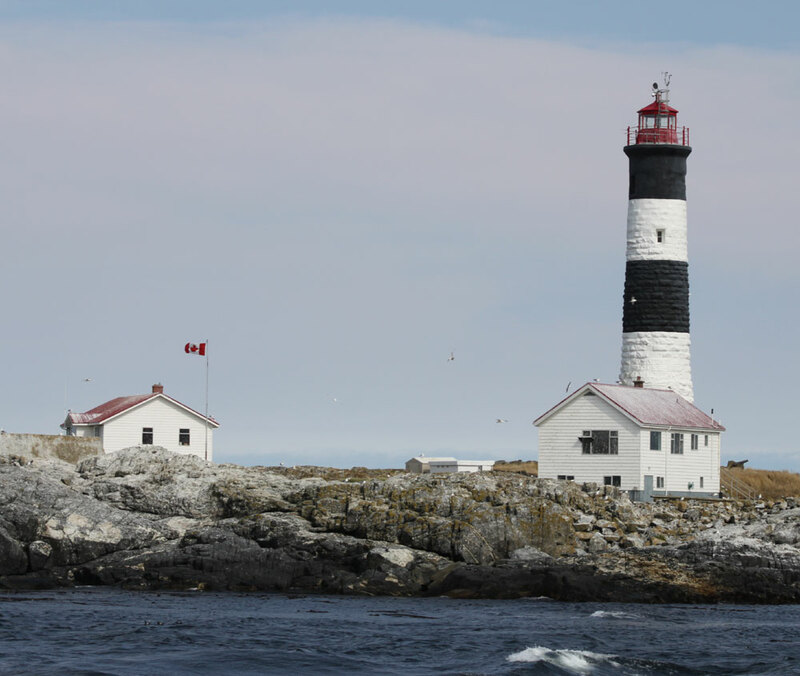 Race Rocks Lighthouse is the 2nd oldest one on the West Coast of Canada, built in 1860. The reserve has video cameras, including one underwater, that you can observe on-line at racerocks.ca. 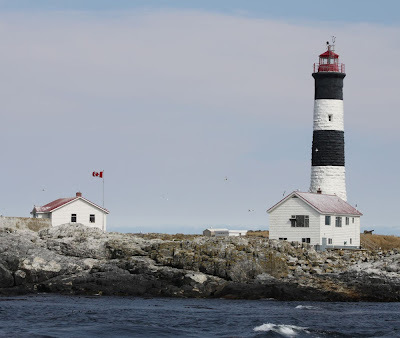 We had a great view of the seals and sea lions, and Race Rocks Island with its distinctive black and white striped lighthouse before we pushed on to the whales. Heading south toward the Olympic Peninsula shore of the USA we shortly discovered two humpback whales. Humpbacks are generally solitary sea creatures, however we found a pair that seemed to be travelling together. They put on quite a show as you will see in the pictures. 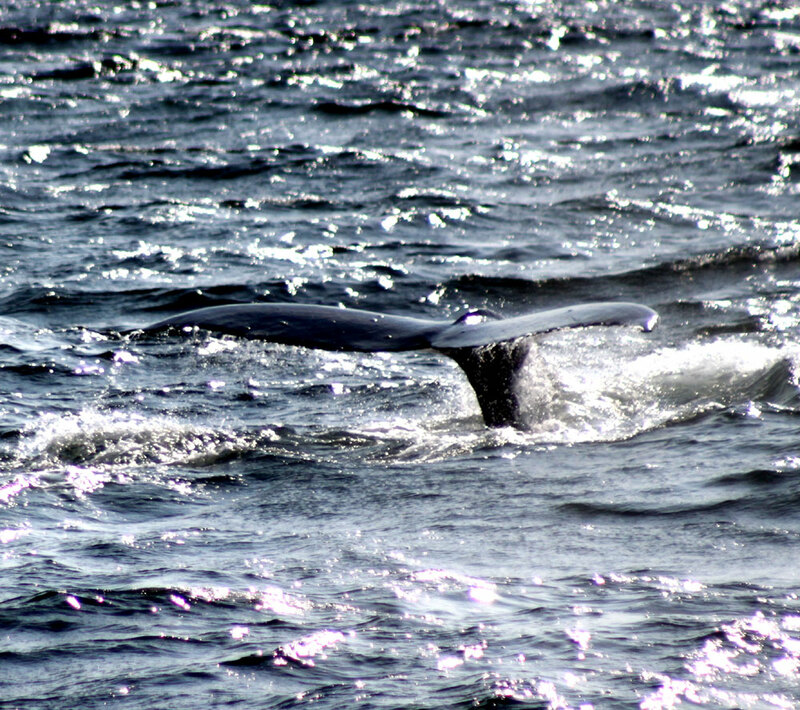 The whales did not breach (jump out of the water) but they did give us lots of good sightings and spectacular tail views as they dove into the depths in search of food. While waiting for them to surface, there is always something to see. The fantastic scenery provided by the mountains of the Olympic Peninsula and the marine traffic in the Strait of Juan de Fuca can keep one quite busy. We were accompanied by several other whale watching boats, some from Victoria, and others we didn't recognize, likely from the USA. All the while, we were being educated by the friendly guides on board. Madison and I stayed on the upper deck and were entertained and educated by Claire Butterfield. Well done Claire! Linda mostly stayed on the sheltered lower deck (where it was warmer!) with another knowlegible guide, Mika. A third guide, Casey stood at the back of the boat where there was more seating. The boat operates a snack bar for people who want drinks or snacks during the trip. The boat is large and capable of holding about 75 people. An added bonus is the head (washroom) on board. Captain Jeff and the Ocean Magic II handled the rough seas well today, and Jeff followed the Vancouver Island shoreline to give us a smooth and scenic ride home. As always, the landscape looked uniquely different from the water as we tried to pick out landmarks onshore. Great job Prince of Whales, we sure felt we were treated royally. We will certainly recommend you to our friends and guests. For more pictures go to our Facebook page.